It is late at night as I walk across the sandy dunes to a desert pool. My headlamp illuminates the way, highlighting obstacles like prickly pear cacti and marauding scorpions. My destination is not far from the trailhead parking lot. I had scouted the area the day before  in the light  so I knew where I was going. The green leaves of a small cottonwood, a water-loving tree, had caught my attention, so I investigated the reason behind their presence. I was pleased to find a desert pool brimming with water from the recent rains. 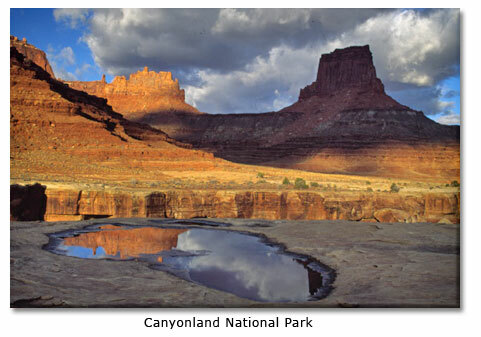 Located at the edge of a slickrock outcrop, this depression had collected runoff. As I scouted the edge of the pond for aquatic life, I observed numerous amphibian tracks in the soft sand. Knowing that many toads and frogs are active at night, I decided to return in the dark to check out the action. As I get closer to the pond, I hear the high-pitched trill of Red-spotted Toads. These are the males, these desert singers, who are calling the females to join them at these breeding sites. Perhaps triggered by the recent rains, these toads know that they may have only a brief opportunity to breed in these ephemeral pools. 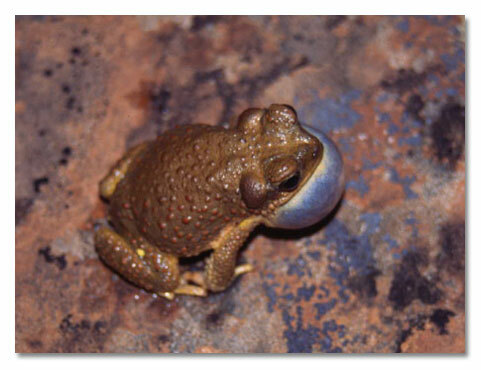 When I reach the sandstone edge of the pool, I see many of these small, warty toads, which have pointed snouts. The chorusing stops, but only for a few moments. Soon one starts, then another, then another, until the blackness seems pierced by the trilling. I unload my camera gear and set up the tripod. I use a macro lens, so I have to watch where I place my camera. I move carefully about the pool and sandstone edge, avoiding the toads that seem reluctant to move. Not that I can blame them. A Red-spotted Toad (Bufo punctatus) is a small, compact toad, one and a half to three inches long. Their squat bodies are grayish to olive to brownish in color. They are covered with small, reddish or orangish warts called tubercles. Often their coloration matches the surrounding substrates. Behind their eyes are two small, rounded glandular structures called parotoid glands. 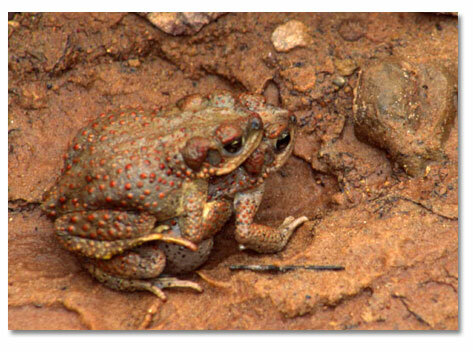 On some toads, these may emit a potent toxin, although these Red-spotted Toads produce little or no toxins. Red-spotted Toads occur from central Texas westward to southeast California and into Mexico and Baja California. A disjunct population (“disjunct” refers to a population of a species that is widely separated from other populations of the same species) occurs in western Oklahoma. Though they breed in watery sites, from water troughs to river edges, these toads have been found in upland areas over one mile from water. They have been found in prairie dog towns in grasslands, no doubt utilizing the cooler underground burrows. 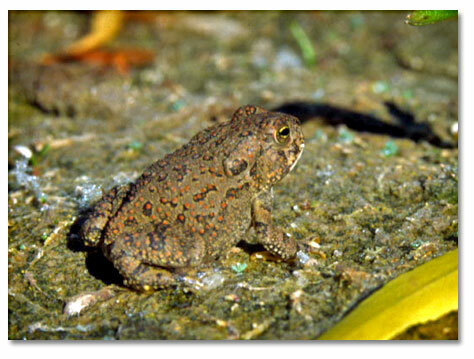 Red-spotted Toads may be found from sea level up to 7200 feet in elevation. Though the breeding season is from April to September, elevation and rainfall influence that timing. Spring or summer rainstorms that are of sufficient duration awaken these slumbering amphibians, and the males leave their underground chambers and start to chorus. The advertisement call is a high-pitched trill that lasts from six to ten seconds. The male’s dusky vocal sac expands with the call. If the males clasp another male or an unreceptive female, they emit a release call that sounds like a chirp followed by a short trill. You can see and hear these calls on the video below. Males chorus from a pool’s edge and wait for a receptive female. The female carries developed eggs, which need external fertilization. When the pair joins, the male mounts the larger female in a piggyback embrace called “amplexus.” She releases her eggs one at a time, rather than in long strings, and is the only North American toad to do so. The male fertilizes the eggs, which are enveloped in a gelatinous coating to protect the embryo. The eggs sink to the bottom of the pool, where they will hatch in only a few hours. Predators and time are the enemies of the Red-spotted Toads. Although coyotes, foxes, raccoons, salamander larvae and some aquatic invertebrate larvae predate on the tadpoles, it is shortness of time that rushes these tadpoles through their developmental stages. Depending upon the size of the pool, the tadpoles take between 40 and 60 days to transform into adults. Sometimes their natal pool will dry out, stranding the tadpoles like whales on a beach. The Red-spotted’s ability to lose 40 percent of its body water and still survive is an adaptation that allows the toad to stray from water or to seek new habitats. Small amounts of water, even dew, may be absorbed through a thin, translucent pelvic patch located behind the legs and extending up onto the abdomen. This allows the toads to absorb moisture and exchange electrolytes through their underside while in contact with damp ground. Though Red-spotted Toads are found along desert streams and rocky pools, they also occur in grasslands, shrublands, river floodplains and desert tinajas (small potholes of water). Isolated cattle tanks or stock ponds make good breeding sites, as well. When I am through photographing these toads, I pack my gear and head back to the car. Above me the star-studded night sky lacks an amphibious constellation, but the chorusing toads remind me that this night belongs to them.